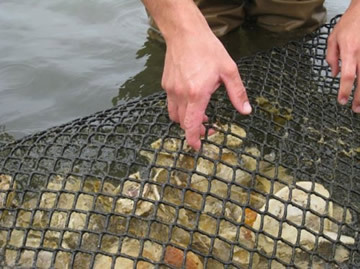 Aquaculture netting from Eagle Pride Supply has a ton of different uses. It’s used for everything from plastic netting for growing, feeding, and trapping on fish farms, sea farms, fish hatcheries, catfish farms, shrimp farms, oyster farms and many other applications for making cages, trays and traps. Plastic netting also makes a great predator barrier. It is durable, lightweight, and an excellent way to ward off egrets, herons, seagulls, nuisance birds, and birds of prey. Eagle Pride Supply heavy duty aquaculture cage netting helps keep out any type of prey such as cormorants, loons, turtles, otters, crabs, and other predators. Select the aperture, or hole size, you need for protection and maximum water flow. Made from long-lasting UV stabilized Polyethylene resin for maximum service life. Offered in wide rolls or cut-to-size pieces to for easy fabrication of trays, traps, or pens.